At Muhlenberg College’s dining hall, Jonathan Powers turns on the ovens, makes sure the eggs contain no blood spots, and inspects the broccoli and cauliflower for forbidden pests. They are some of his duties as the Allentown college’s mashgiach, a Jew who supervises a food establishment to make sure the dietary laws of his faith are followed. The college hired him five years ago when it opened two kosher food stations in its new dining hall in an effort to better serve Jewish students. For Powers, the work is a family tradition; his mother, Louise, 66, is a kosher supervisor at Dickinson College in Carlisle, Pa., and his father, Mark, 66, holds the job at Franklin and Marshall College in Lancaster. Nearly a third of Muhlenberg’s 2,200 students are Jewish, among the highest percentages of any non-Jewish college in the country, and just behind Barnard College. Russ especially likes that the two kosher stations, Noshery North for dairy and Noshery South for meat – Jewish dietary law requires that dairy and meat be served separately – are integrated within the main dining hall, along with an Italian restaurant, a grill, a salad bar, and other stations. Students do not have to pay extra for food from the stations, and they can eat with everyone else. Not all colleges have a mashgiach, but the role is becoming more common as schools aspire to serve students’ diverse dietary needs. Some colleges include kosher food at their Hillel International buildings; some integrate the service into their dining halls. The University of Pennsylvania and Temple University both offer kosher food under kosher supervision. The University of Delaware added a mashgiach this fall when it opened a new dining hall. At their schools, the Powers family members chart recipes, plan menus, and order the food. “It’s a dynamic trio. They really are,” said Rabbi Mayer Kurcfeld, administrator at Star-K Kosher Certification, a Baltimore-based agency that helped to place the Powerses. All three Powerses are veterans of the food industry and for a time ran a Chinese restaurant, Yi-Tzi Peking, in Bala Cynwyd. Mark Powers was the first to become a kosher supervisor. He started seven years ago. When Star-K was looking for a supervisor for Dickinson a year later, he recommended his wife. A year after that, his son heard about the Muhlenberg job. He had been working for a kosher food manufacturer in Allentown. They all were trained in the fine details of the job. “I had to learn how to find bugs in leafy vegetables,” Mark Powers said. Consumption of insects is prohibited. Mark Powers also does some of the cooking at F&M. “I’m a chef, so I cook,” he said. The family shares trade secrets. Mark Powers took his wife’s fish taco recipe. Father and son swapped ideas for a hot dog bar. When they get together for dinner at the parents’ home in Harrisburg, shoptalk is on the menu. “Now that my mother’s in it, my father’s in it, and I’m in it, that’s all we talk about at the table,” Jonathan Powers said. 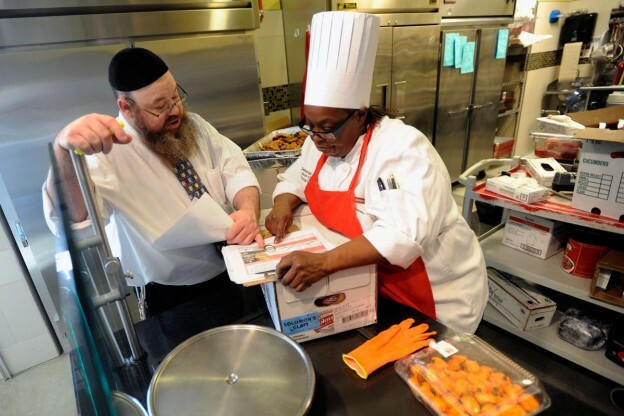 At Muhlenberg, the kosher kitchen also serves the broader community. One morning, a local rabbi stopped by to place an order. Earlier that day, a worker from a Reading-area drug and alcohol treatment facility picked up meals. The night before, the kitchen had catered an event at the Jewish Community Center. The food stations begin serving each day at 11 a.m. First, Jonathan Powers had to light the hot plate. The rules that govern kosher food preparation (kashruth) require that mashgiachs light fires and ensure that diners are not served eggs with spots of blood. The stations are open for lunch and dinner. When they are closed, locked gates cross the entrance so no contamination occurs.